Unaceptable Levels: Documentary from Food Democracy Now! 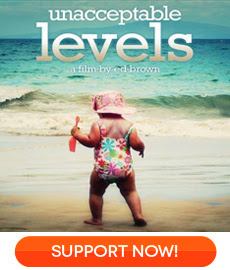 Unacceptable Levels is a groundbreaking documentary that details the harmful impacts of the chemical revolution of the 1940’s as told by the pioneering vision of friendly father and filmmaker Ed Brown. Join Ed as he interviews top minds in the fields of science, advocacy, and law regarding the devastating impact that the lack of proper oversight over toxic chemicals is having on America’s children today! Follow Brown’s riveting storytelling to learn how the chemical revolution brought us to where we are, and where, if we’re not vigilant, it may take us. Watch the powerful expose Unacceptable Levels to find out how Your body has become ground zero over chemical pollution today. This entry was posted on Friday, May 16th, 2014 at 7:49 am	and is filed under Health Matters: Flashes & Reports. You can follow any responses to this entry through the RSS 2.0 feed. You can skip to the end and leave a response. Pinging is currently not allowed.